By the fountain at Columbus Circle, New York City, a designer with a sense of humor plants decorative onions to reflect the globe sculpture across the street. Giant allium bulbs are ready to plant now for next spring and summer bloom. In fall catalogs, they're usually bunched dismissively with "other bulbs" after the ever popular tulips and daffodils, an afterthought. But they have the advantage of being showy, deer and rodent resistant because of that oniony aroma, useful for container planting, and unlike daffodils and tulips, the seed heads continue to look great in the garden and in a vase long after the flower has passed. Above, seed heads in July add structure and style to a few plants of santolina. if you want them to last. 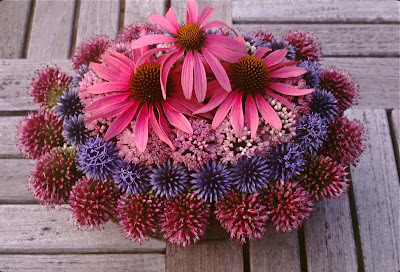 and several cone flowers, stems cut very short and stuck in wet floral foam. 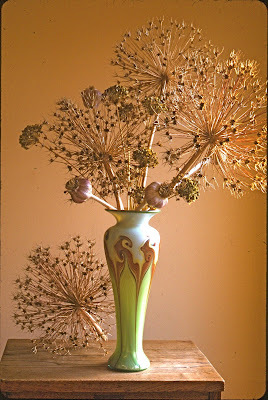 Love allium, love this post. Your ornamental creation is beautiful. Urban Gardens, I once decorated a small Christmas tree with allium seed heads instead of glass balls and other more colorful bunches of dried flowers. I'm desolate that I took no photo. Cheval, You're warm enough for the Allium schubertii. Take a look in any good bulb catalog.